Although it constitutes a large part of our activities at PhytoChemia, essential oils analyses are in fact a special case for chemists. Indeed, it is one of the only cases (along with hydrosols, fatty acids methyl esters and a handful of other applications) where the approximation "concentration ≈ % of total integration" can really be applied, as we have previously discussed, since all compounds in the sample are believed to be volatile. We have also seen that although FID is superior to MS in this regard, and recommend by the ISO norms, if a great deal of precision is required, other methods of quantification should be used. The vast majority of tasks in analytical chemistry are rather focused on obtaining a precise determination of a given molecule in a matrix. This applies to natural products analyses as well as pharmaceutical preparations, environmental studies, food safety control, and medical analyses. The best way to achieve this is to perform a full calibration against a known, pure molecule standard. Let us say that you are marketing a decongestant balm with menthol as an active ingredient. It is a good practice to make sure that every batch contains the same amount of menthol. This way, you garantee that your customers will always get the same result when using your product. Your recipe is fixed, but if you use mint essential oil as an ingredient, you have a variable to take into account: just how much menthol does your oil contain, exactly? In this case, using a relative response factor by the FID chromatogram method is imprecise. The real percentage of menthol in the oil is not exactly what you will read in a common essential oil report, since some bias is generated by this method. Remember, the approximation is used in essential oils analysis by scientific convention for comparative purposes, as essential oils testing would otherwise become an analytical nightmare. To quantify the menthol, the chemist will prepare a series of dilutions of menthol of known concentration, prepared from an analytically weighed pure menthol standard. Each standard will be injected with a fixed method on the GC. A calibration curve* will then be obtained (figure 1), plotting the FID response against the actual real concentration of menthol in the solution injected. The R2 value is an indication of how well the trend line drawn passes through the plotted dots. The closest to 1, the better. Figure 1. 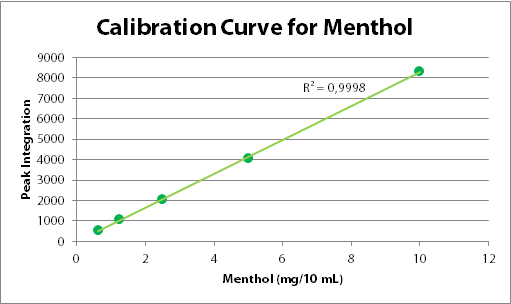 Fictive calibration curve for menthol. With such a curve, the chemisty can straightforwardly calculate, from a given response obtained on his apparatus, the corresponding menthol concentration, as long as it falls within the range of calibration solutions. The next step is to prepare a proper, known dilution of the essential oil, then to inject it. Knowing to which extent the oil has been diluted, simple calculus can indicate just how much menthol was present in the oil as a mass/mass ratio. It then becomes simple for the manufacturer to adjust the mass of oil to add to his recipe so as to obtain the wanted amount of menthol, which can then reliably and honestly be written on the ointment label. And it would work whatever the mint essential oil batch used! Of course, there are a number of tricks to this apparently simple task. Analytical chemistry is a science of subtelty and details, and overcoming coelutions, analytical biases, proper sample pretreatment and required precision is a specialized task. Some residual statistical incertitude always subsist, which is why the analyses are usually ran more than once, with the mean given as the final answer, along with some indication of its precision. Most of the time, an analysis is considered satisfactory if the response given is within a 5% margin of the true value. So remember, if for any reason you need a precise quantification of a constituent, the best way to go is a full calibration against a known standard. *The term curve is used despite the function being a straight line, since in some instances the instrument response may not be linear. Other mathematical functions can also be acceptable, as long as the analysis is proven to give a reliable answer under the conditions of use.